If you are new to a Jewish family, you may have encountered ethnic food that is special to that family but new to you. Or, you might be looking for accessible ways to bring Judaism to your family or partner. This is a basic guide to some of the foods you might see, and to terminology. We recognize this can’t possibly be comprehensive. If you want to contribute more information or recipe ideas, let us know in the comments! Looking for interesting recipes to add to your table? Visit our food blog. For a short explanation of why Jewish food is the way it is, read Understanding Jewish Food Traditions. And if you want the recipe for the Kabocha (Japanese Pumpkin) Challah above, get it here. What’s that mean? Kuchen is German for cake. It usually means a coffee cake. In my family, it was always apple cake. What’s in it? The version I grew up with was a yeasted coffee cake with apple filling and streusel topping. When do you eat it? For dessert with tea. What’s it like? Yeasted coffee cake is a delicious, satisfying sweet. 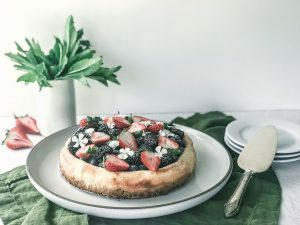 Since kuchen just means “cake,” other people might have another supernal example of cake in mind when they say this, like a plum torte or an apricot cake. Do not hesitate to comment and share yours. What’s that mean? It means grandmother in Polish, probably because the Polish version of the cake looks like a tall hat that someone associated with their grandmother. What’s in it? The Jewish version is a yeasted cake with chocolate or cinnamon-sugar filling swirled through it. Try this Pecan Pie Babka recipe—a decadent twist that will have everyone asking for more! Why/when do you eat it? You can’t have too many kinds of yummy cake to have with hot drinks. On the TV situation comedy Seinfeld, there was a famous sketch about buying babka to bring to a dinner party. What’s it like? It’s a very sweet cake with a bread–like crumb. What’s that mean? Bagel comes from a Yiddish word meaning ring. What’s in it? Bagels are hard rolls with a hole in the middle. To get them properly hard and chewy, bakers make them with high-gluten wheat flour and boil them in water before baking. Traditionally, bagels were flavored with onions, garlic or seeds on the outside of the bread. The raisin, blueberry and (horrors) chocolate chip versions may be tasty, but they are not traditional. When do you eat it? Bagels are not associated with any holidays. Many North American Jews have a tradition of eating bagels on Sunday mornings as part of brunch. A bagel with a schmear is a bagel with cream cheese. A bagel with lox usually has cream cheese too. Bagels are also good with hummus. What’s it like? Authentic bagels are crusty, hard and chewy bread. What’s that mean? Bialy is short for Bialystoker kuchen, Yiddish for Bialystok cakes or rolls. (Bialystok is a city in contemporary Poland, on the border with Belarus). What’s in it? 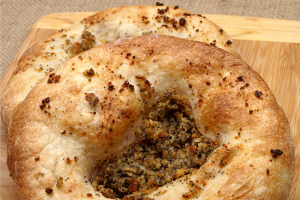 A soft yeasted bread dough similar to pizza, baked in small rolls with onion and poppy seeds in the center. When do you eat it? Not associated with any holiday, bialys are a special regional bread. You can eat them when you’d have a bagel or any bread. What’s it like? A softer bite than a bagel, bialys are fragrant and oniony. Mimi Sheraton wrote a book about them, The Bialy Eaters, that tells their history and how to make them. What’s that mean? The Yiddish word blintzeh comes from a Slavic word (in Russian, Polish, Lithuanian, etc.) for a thin pancake. What’s in it? 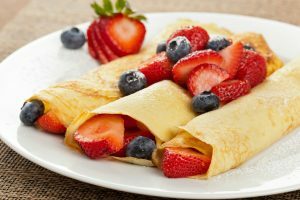 Blintzes are usually thin pancakes made with wheat flour, eggs and milk that are fried on one side, filled with fruit, cheese or potato filling, and then fried again once filled. Unlike Russian blini, Jewish blintzes are not usually made with yeast. When do you eat it? Because they are fried, some Jews like to eat them on Hanukkah. Because they are usually dairy, some eat them on Shavuot. Because they are yummy, you can have them any time! In the 1970s there was a fad for making blintz soufflé—cheese or fruit blintzes, bound together in a casserole with a sweet custard, and then cut in pieces. What’s it like? These are easy to love—like a slightly less-fussy crepe. You can buy them filled and frozen or make them from scratch. A lot of people like them with sour cream on top, or if they are cheese blintzes, with fruit. Try Ruth’s (a former IFF staff member) great-grandmother’s recipe for blintzes. What’s that mean? Borscht comes from the Russian and Polish words for soup. What’s in it? Usually Jewish borscht is cold beet borscht. Most recipes call for beets and something sour, like pickle juice or lemon. The soup is often served with boiled potatoes, boiled eggs and sour cream. There is also a hot borscht made with cabbages and beets. Unlike Russian versions of beet borscht, Jewish versions usually aren’t made with meat, because Eastern European Jews like their borscht with sour cream and kosher laws prohibit eating dairy and meat foods together. What’s it like? Beets have a faintly sweet flavor that some people love and some don’t. If you like beets, you’ll love borscht. What’s that mean? Brisket, contrary to what my sister thinks, is not a Yiddish word. It’s an English name for the part of the cow that’s right above the front leg. What’s in it? Brisket is the cut of beef that many Jewish families prepare for holidays. It’s relatively tough and requires a long cooking time, and was less expensive to prepare that to feed large Jewish extended families. Some families prepare it with onion soup mix or cola or other secret ingredients. When do you eat it? Many North American Jews prepare brisket for holiday meals. Here’s one to try—a Southern dry-rub brisket. What’s it like? The meat is braised and cooked until very tender and then sliced thin. It’s often prepared sweet and sour. What’s that mean? The Hebrew word means something like “sacrifice.” It refers to the portion of the dough separated out during baking to remind the baker of the sacrifices in the holy Temple in Jerusalem in ancient times. Some write it “challah” to represent the heavy inital h sound, like the J in José. What’s in it? 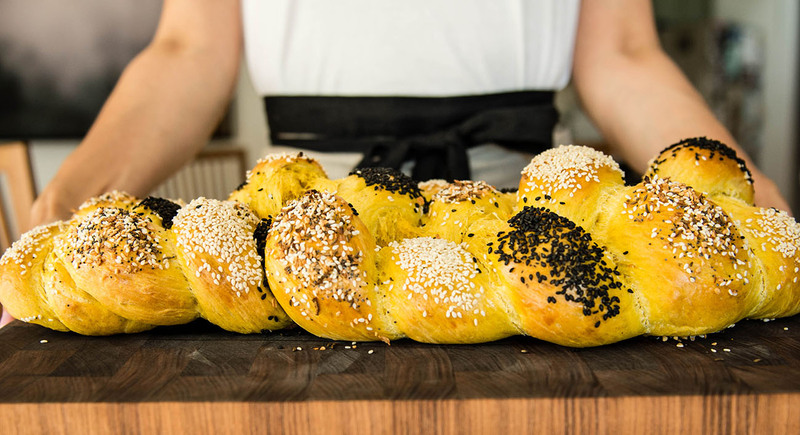 The braided or round bread that Ashkenazi Jews call hallah is a white bread, often enriched with egg and sweetened. Sometimes raisins are added, in particular on Rosh Hashanah. Some make whole wheat hallah, but getting it to be light enough is a big challenge. “Water hallah” is made without egg. “Yud beis hallah” is made of 12 separate mini-loaves. When do you eat it? Shabbat and holidays, excluding Passover. Round hallah is traditional on Rosh Hashanah. 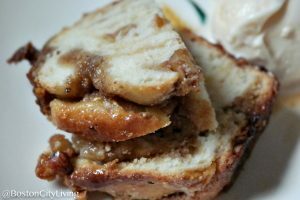 Here’s a great recipe for a cinnamon roll hallah with an Italian twist. What’s it like? Fragrant and often sweet white bread, sometimes with raisins. If you hang out in Jewish communities, you’ll hear a lot of small children asking for more hallah. 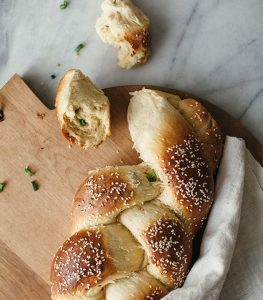 With these three different hallah recipes, you’ll be asking for more: Guinness Challah, Scallion Pancake Challah and Kabocha (Japanese pumpkin) Challah. What’s that mean? This is the English name, because this cheesecake is North American Jewish sweet. What’s in it? Obviously, lots of people like various cheesecakes! North American Jews make a rich cheesecake with cream cheese and eggs and a crumb crust. It often has a sour cream topping. This style of cheesecake has become widely popular. When do you eat it? Some like to eat cheesecake in honor of Shavuot, a holiday during which dairy foods are traditional. People who keep kosher would not eat this as a dessert for a meat meal, because the kosher laws prohibit mixing milk and meat. Looking for a non-dairy option? Try this Lemon Tofu Cheesecake recipe. What’s it like? Rich and sweet, usually with strawberries or blueberries on top. What’s that mean? Jews from Eastern Europe have a tradition of making chicken soup with all the permitted parts of the chicken, which includes the feet. What’s in it? Chicken feet aren’t particularly meaty, so it’s a mystery why people think they impart special flavor to soup. Micah Sachs thinks it’s because of the marrow content in the bones. When I ate chicken, I had soup made with the feet, and it was good soup, but it might have been because the person who made it was a good cook. When do you eat it? This is one of several poverty foods that Jews brought with them into prosperity. Eastern European Jewish food has a special place for chicken soup on Shabbat and holidays, and also whenever someone is sick. What’s it like? Usually people take the feet out after they’ve made the soup, so it’s probably like any other chicken soup. What’s in it? There are many versions of this stew which is simmered overnight from Friday until Saturday so that observant Jews can have hot food without cooking it on Shabbat. The most popular Ashkenazi version is with barley, beef and beans. Jews from Muslim countries make versions with rice, sometimes called Dafina or Adafina. There are also vegetarian recipes in wide circulation. Some hard-boil eggs in the stew, so that they become colored and flavored by it. When do you eat it? On Shabbat for lunch, though some people like it so much they’ll eat it during the week. What’s it like? Stodgy, savory and usually difficult to digest. It often has special dumplings in it. What’s that mean? Haman’s pockets. Haman is the villain in the Book of Esther, the biblical text read on Purim. The singular is hamantash, though you might not get to use that knowledge outside of a crossword puzzle. What’s in it? A pastry made of cookie or yeasted dough, filled with jam and folded in triangles. One traditional filling is made out of poppy seeds, which can be a little strange when you first try it. When do you eat it? Hamantashen are a Purim treat, often included in mishloah manot, the goody bags for friends and family that are part of the celebration. What’s it like? Some are more like thumbprint cookies, some more like Danish pastries. You can make them with any filling you like—try this double chocolate mint hamantashen recipe. 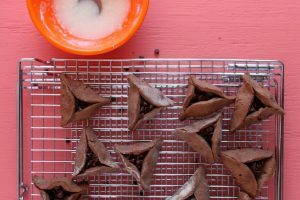 There’s also a gluten-free chocolate hamantashen recipe here and a savory one here. If Purim didn’t seduce people with the joking, costumes and revelry, the hamantashen might do it. What’s that mean? In Slavic languages, including Russian, it means cereal. In Yiddish it usually refers to buckwheat groats specifically. What’s in it? Buckwheat groats. Buckwheat is eaten like a grain, but it’s called a pseudo-cereal because it’s not related to any of the grasses like other grains are. An import from North America to Europe in the 1500s, buckwheat grew well where other grains were difficult to grow. One Jewish dish is kasha varnishkes, in which the kasha is mixed with bow-tie noodles. When do you eat it? Kasha is a good dinner dish. What’s it like? It has a nutty flavor and a texture like other cooked grains. It’s fun to eat with bow-tie noodles and delicious with mushrooms. What’s that mean? Kichel means a little cake–a cookie. What’s in it? These are eggy, not-very-sweet cookies. When do you eat it? A specialty of Lithuanian Jews, kichel are good with a glass of wine and are often part of the spread of goodies that synagogues set out after services on Friday or Saturday. What’s it like? A good piece of kichel is light and airy, with a snap when you bite it. The ones I grew up eating were small light-brown rectangles of dough with a twist in the middle. It’s not meant to be super-sweet. Some bakers put sanding sugar (the big sparkly crystals) on the outside to make them slightly sweeter and prettier. What’s in it? Either a cleaned cow’s intestine or an artificial casing is filled with matzah meal, chicken schmaltz and spices. There are vegetarian versions of this. When do you eat it? It’s a kind of sausage that some put in their cholent. What’s it like? I don’t have nostalgia for this food–it was one of the ones my parents ate growing up but didn’t want to serve their children. Israeli restaurant critic Daniel Rogov says the ideal kishkeh is peppery and oniony, plump in its casing and full of fat. What’s that mean? Knish is a Yiddish word for a pastry or turnover. These are usually baked, sometimes fried, with a savory filling. What’s in it? Most knishes are made with a short dough, often containing mashed potato. Knish fillings include potato, spinach, kasha, meat and mushrooms. When do you eat it? Small knishes are a common party food. Larger ones are a nice snack. What’s it like? 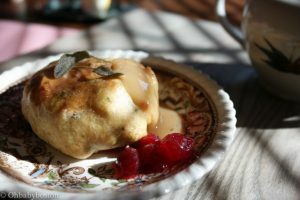 Usually served hot, knishes are savory, with a flaky exterior and a soft, toothsome filling. Try this recipe that uses Thanksgiving leftovers. What’s that mean? Kosher is Hebrew for appropriate or fitting. It refers to the Jewish religious food rules. Deli is short for delicatessen, which comes from German words meaning yummy food. Just to be confusing, sometimes food combinations that aren’t actually kosher are part of kosher deli food–because the term refers to Eastern European Jewish food in general. If you want to be sure, a kosher restaurant, whether it’s a delicatessen or not, will serve either dairy foods or meat foods, but not both, and will have a certificate posted in a prominent place that shows a rabbinical team does inspections of ingredients and cooking methods in the kitchen. When do you eat it? It’s restaurant food, so at times one would be in a restaurant. Some Jewish communities also rely on kosher delicatessens to send platters of food to houses of mourning. Delis are often packed on Sunday mornings. What’s it like? The Yiddish word for tasty is “geshmak.” Jewish deli food is salty and fatty, sour and juicy, chewy and crusty. The delicat in delicatessen is for delicious, not delicate. What’s that mean? It’s actually a misnomer. All plain salt is kosher. (In fact, most flavored salts are, too–including, bizarrely, this new product called bacon salt.) Kosher salt should be called “kashering salt” because it refers to the big salt crystals used to make meat kosher. What’s in it? Usually just sodium chloride. Most kosher salt isn’t iodized. That’s not because iodine isn’t kosher; it’s because there’s no need to iodize salt that’s going to be used to draw the blood from meat. When do you eat it? In Jewish cooking, kosher salt is used to draw the blood from meat, to “kasher” it (make it kosher.) When I was a child, my grandmother used to put a brisket on a tilted board and salt it all over so that the blood would run out. Then she would rinse the salt off the meat. These days, most kosher butchers will kasher the meat as a service to the consumer. Frozen kosher meat must be pre-salted. A lot of chefs who aren’t preparing kosher food like to use kosher salt because the big crystals are fun to pick up and throw on food. What’s it like? Some claim to be able to taste differences in mined and sea salt, iodized and uniodized salt. I’m unfortunately not that sophisticated. I agree with the people who like the texture of kosher salt crystals. What’s that mean? A Yiddish word for little dumplings. What’s in it? Kreplach are small filled dumplings with a pasta shell, a little like pierogis or wontons. They usually have a meat filling, but they may also be made with potato. When do you eat it? These are a special-occasion food, probably because when people made everything from scratch, these took a lot of work. There’s a tradition of eating them on Purim for the same reason as people eat hamantashen–because Purim is the holiday of hiddenness, and kreplach have a filling hidden inside. What’s it like? Like wontons–indeed, some believe that all filled pasta dumplings originated in China. What’s that mean? Krupnik comes from a Polish word meaning barley. In Yiddish it refers to this soup. What’s in it? Usually, barley, dried mushrooms, potatoes and carrots. The Polish soup by this name sometimes has both beef and sour cream in it, but a Jewish version would have either one or the other–or neither, just vegetables. When do you eat it? Eastern European Jewish immigrants to the U.S. in the early 20th century ate soups like this one with bread for weekday lunches. What’s it like? Savory, thick soup. If you’ve never had barley, it absorbs a lot of water and gets thick and viscous. What’s that mean? It’s a variant pronunciation of kibbeh, an Arabic word meaning ball. What’s in it? Syrian and Iraqi Jews make fried dumplings out of semolina flour that are shaped like fingers and stuffed with ground meat. There are also stuffed soup dumplings with the same name that are simmmered in soup. When do you eat it? Nearly everything in my food line-up is Ashkenazi, because like most Jews in the United States, my family is Ashkenazi from Eastern Europe and came over to the U.S. in the 1880s. Kubbeh is an incredibly important dish to Jews in Israel, and if you married into a family with their roots in Syria or Iraq, you probably eat these for special occasions. What’s that mean? It comes from a German word meaning a ball, but today refers to a flat casserole, usually bound together with egg. What’s in it? A baked dish with a starch (noodles, potatoes or rice, for example) or vegetable (carrots, broccoli or zucchini make good ones), bound together with egg. They can be savory or sweet. When do you eat it? It’s a great side dish for a Shabbat or holiday meal. Dairy kugels are not eaten at meat meals. Kugel can be served hot or at room temperature. 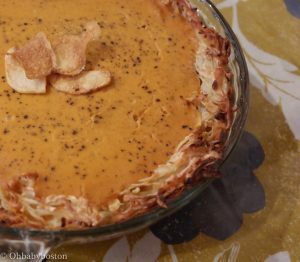 This potato and pumpkin kugel recipe is a great fall dish, but can be enjoyed all year round, too. What’s it like? Kugels are pretty varied, but all are substantial food. The most popular is a sweet dairy noodle kugel (like this dairy matzah kugel recipe) with cottage cheese, raisins or other fruit that could be dessert or breakfast. Try this sweet summer kugel bites recipe. Have leftover kugel? Transform it into this kugel stack. What’s that mean? It means small pancake. It’s usually a shallow-fried pancake of grated or ground potato, flour and egg. What’s in it? Potato, flour and egg. It’s usually served with sour cream or applesauce. Here’s a great recipe with potatoes. These recipes take latkes to another delicious level: red and green latkes; mochi latkes; and roasted garlic caprese latkes. When do you eat it? Latkes are potato pancakes that Ashkenazi Jews prepared as part of Hanukkah. 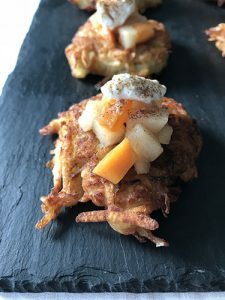 It is traditionally eaten during Hanukkah along with many other fried foods, but latkes are a great side dish anytime! What’s it like? Crispy and crusty on the outside and plump and almost cake-like on the inside. And it’s deliciously fried in oil! Check out this video on how to make the perfect latkes. What’s that mean? Smoked or cured salmon. What’s in it? Salmon, a lot of salt, and sometimes sugar. When do you eat it? For Sunday brunch and with dairy meals. (Fish isn’t considered meat in the kosher laws.) It’s good with bagels. What’s it like? Salty and smooth and silky on your tongue. It’s cured, not cooked, so it’s a little like eating sushi. What’s that mean? It probably means something like “macaroni” because the Italians who invented it thought the dough looked like pasta, even though it’s a cookie. What’s in it? A cookie made with egg whites, sugar and coconut or almonds. Some are made in the Italian style out of apricot kernels. When do you eat it? Jews made this cookie a favorite because it contains no flour and may be eaten on Passover. What’s it like? Good macaroons have a crisp thin outer crust and are chewy inside. The coconut ones that come in a can for Passover are chewy all over and very sweet. They now come in crazy flavors, like Rocky Road. What’s that mean? Cornmeal mush. What’s in it? Corn grits. It’s like a thick polenta. When do you eat it? Mamaligeh, also spelled mamaliga, is a Romanian specialty. Jews typically served it with dairy meals–with cheese and butter. It’s traditionally cut with a string, stretched taut. What’s in it? Mandelbreidt are hard cookies like biscotti. They contain almonds and are usually baked twice. When do you eat it? They’re good to eat with tea or coffee. In some synagogues, you might see mandelbreidt on the table with snacks after services, to be eaten with the wine from Kiddush. What’s it like? Most mandelbreidt are twice-baked and really hard and crispy. Some bakers add raisins or chocolate chips and sprinkle them with cinnamon sugar. My husband has a recipe for mandelbreidt with a jam filling that’s apparently an uncommon variation, but really good. What’s that mean? Matzah is the unleavened bread eaten on Passover. When do you eat it? Passover, and during the year if you haven’t managed to finish the boxes from Passover or really like it. What’s it like? It’s like a cracker or crispbread, hard and dry. You can eat it like bread with butter or margarine, cream cheese and jelly. In my family we eat matzah with guacamole. Looking for a twist on matzah? Try this matzah chilaquiles recipe. What’s that mean? Matzah ball is the English for knaidel, a round dumpling made of ground matzah (matzah meal). What’s in it? Most recipes call for matzah meal, egg and salt. Depending on the family tradition, they can also contain schmaltz, seltzer or broth. When do you eat it? These are a special Passover treat, but people like them so much that they eat them all the time. What’s it like? Some people prefer light, fluffy matzah balls that float in the soup. Others like substantial matzah balls that sink. Some prefer them with flavorings like ginger or dill, and others just want the flavor of the soup. 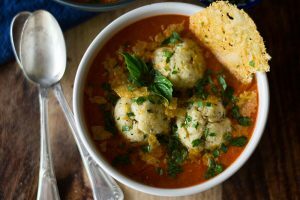 Try this roasted tomato soup recipe that use matzah balls or this one with a bone broth and potato knaidlach. What’s in it? Matzah, eggs, oil and water. When do you eat it? For breakfast on Passover. Some people like it enough to eat it at other times. What’s it like? Some soak the matzah in water before mixing it with the beaten egg, and then fry it in oil, or sometimes butter or margarine. It usually comes out like a big pancake or frittata, though some prefer it with the matzah very soft and loose. I enjoyed New York Times food writer Mark Bittman’s discussion of matzah brei, including a video of him discussing the dish with architect Frank Gehry. What’s that mean? Pareve is a technical term in kashrut that means neither milk nor meat. People who keep kosher don’t eat dairy products and foods that contain meat together. Pareve foods may be eaten with either. What’s in it? Pareve foods include eggs, fish and all vegetables and fruits. Some surprise foods that are pareve: mayonnaise, most brands of sorbet, lox. When do you eat it? If you keep kosher, pareve foods are great, because you can eat them at any meal. If you don’t keep kosher and you are trying to avoid dairy products because of an allergy, pareve foods are not supposed to be prepared on dairy equipment. (Some foods don’t contain dairy products but are marked “dairy equipment” for allergic people and those who keep kosher.) Pareve food might contain animal products, so don’t use the pareve label to ensure that food is vegan. What’s it like? Some pareve foods, especially desserts that usually have butter or cream, are just awful. Others are a delicious tribute to the incredible ingenuity of good bakers and cooks. Feel free to leave recipes or recommendations for the latter in comments! What’s that mean? The word probably comes from a Turkish term for pressed meat. What’s in it? A variety of preserved beef brisket, pastrami is the Jewish version of a Romanian meat dish. (Non-Jewish Romanians often use non-kosher meat to make the pastrami.) Pastrami is brined with additional spices and then smoked. It can also be made with turkey. When do you eat it? It’s a deli meat, usually eaten in sandwiches. A classic kosher deli sandwich is pastrami on seeded rye bread with mustard and a pickle. What’s it like? Pastrami is usually sliced thin and piled up warm on the bread. It has a smoky, vaguely sweet flavor and a lot of fat. What’s that mean? Herring is a small fatty fish that lives in the Atlantic. Since it swarms in large schools, it’s often fished in large quantities and preserving it with salt in barrels was a good way to keep it. It was a poor people’s food in Eastern Europe. When do you eat it? Chopped herring salad is served as an appetizer to formal meals. Some synagogues also serve herring, usually with schnaps, as part of the food that accompanies Kiddush after services. What’s it like? It’s salty, slightly sweet and chewy. What’s in it? According to fermentation expert Sandor Ellix Katz, properly made sours are brined, not preserved in vinegar, and get their sour flavor from the fermentation process. Whether the brine is all salt or part vinegar, the pickles also get flavor from cloves of garlic, dill weed, dill seed, peppercorns and sometimes coriander seeds. The best pickles have cloudy brine and lots of these herbal bits floating at the bottom. When do you eat it? Pickles are good with a sandwich in a deli, on a cut-glass dish to round out a meal or just out of the jar for a snack. You might need help getting the jar open, as the fermentation action inside sometimes creates a powerful vacuum. What’s it like? You can get pickles at all stages of fermentation: new pickles, half sours or full sours. Half sours are my favorite. (The same goes for sauerkraut–usually the jars are marked “new kraut.”) The little Israeli cucumber pickles from a can are very sour and limp and preserved in vinegar–those are the ones that come in a felafel. In Israel you can also get pickled eggplant, which looks like it comes from Mars and is, in my opinion, completely awesome, and pickled turnips, which are beautifully colored and crunchy. What’s that mean? It’s Aramaic for bread. Aramaic is a Semitic language related to Hebrew and Arabic, and it was the language of the Talmud. What’s in it? It’s a round yeasted flatbread made with wheat flour, water and salt. When do you eat it? In the Middle East, this is the ordinary bread, eaten by people of all ethnicities. It can be used for hallah on Shabbat because each round, frisbee-like piece is a single loaf. In Israel, it’s split open and used to make felafel sandwiches. What’s it like? The best pita is freshly baked, and puffs up, creating a pocket. My family used to buy pita from Lebanese Christians where I grew up in the Midwest, because that bread was the closest to the bread we’d developed a taste for when we visited Israel. What’s that mean? Calf’s foot jelly. It’s pronounced and sometimes written ptchah–ch like in English, not a heavy h sound. What’s in it? It’s made by boiling calf feet. When do you eat it? It’s a first course, like aspic. What’s that mean? Rugelach are cookies. The name comes from Yiddish diminutive of a Hebrew word, roglit, meaning vine. The ch at the end is like the one in Loch Ness. What’s in it? Rugelach are rolled up pastry dough with jam, raisins, chocolate and/or nuts rolled into them. Unless they are marked pareve, the dough is made with cream cheese or cottage cheese. The cream cheese pastry is surprisingly easy to make well. The pareve version of this pastry is probably made with margarine or oil. When do you eat it? It’s a good recipe for Purim because there are hidden goodies inside the cookies, and Purim is the holiday of hidden things. Of course, since this is a Jewish food guide, coming up with occasions on which to eat sweets isn’t all that difficult. What’s it like? The pastry is flaky and the fillings are sweet, and there’s a nice contrast between the richness of the pastry and the fillings. 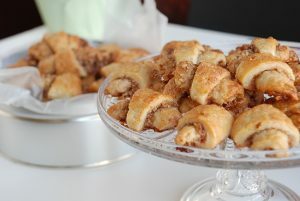 Try this cream cheese rugelach with cinnamon and brown sugar recipe. What’s that mean? Yeasted bread made out of rye flour. What’s in it? The rye bread most associated with the Jewish community in North America is made of rye and wheat flour. Usually it’s made with a sourdough starter and a long, cold fermentation to give it a sour flavor. The light, sissel rye bread is made with caraway seeds throughout. Pumpernickel is also a rye bread. I grew up eating pumpernickel raisin bread. When do you eat it? It’s part of deli sandwiches and generally important to Eastern European Jewish culture. A lot of other cultures like this bread, too. Rye was the main bread grain of Eastern and Central Europe, in particular because it grew through the winter. It’s a bitter grain and has to be baked with special techniques to make it palatable. In other words, it’s another poor people food that made good. What’s it like? Rye bread is real bread, with a strong bite to it. The caraway seeds give it a good smell. What’s that mean? Yiddish for fat. In colloquial Yiddish, it also means sentimentality. What’s in it? Rendered (purified) chicken or goose fat. When do you eat it? In some families, schmaltz continues to be a cooking fat of choice for meat meals, and some even use it as a spread on bread. It used to be difficult to get kosher for Passover margarines and oils, and so some have a custom of using schmaltz in particular at Passover. What’s that mean? In Yiddish, as in German, schnaps is any strong alcoholic drink. Whisky, which is bronfn in Yiddish, is sometimes also called schnaps. When do you eat it? Some synagogues serve schnaps with herring as part of the snacks with Kiddush after services–and in some congregations, it was the custom to serve it at daily morning services that people attend before work. In my family growing up, we had schnaps with canned peaches and herring to break the fast on Yom Kippur. What’s it like? It’s a little strange to serve hard liquor after services, especially since Jewish culture is pretty negative about excessive drunkenness. But schnaps does go well with pickled herring. What’s that mean? Sour cream is a cultured dairy product like yogurt or buttermilk. It’s considered a fermented food. American sour cream is similar to the French créme fraiche, the Mexican crema and the Eastern European smetana. When do you eat it? In Eastern European Jewish cuisine, sour cream goes on borscht, blintzes and latkes as a condiment. Some families also dip bananas or peaches in it. People who keep kosher do not eat this dairy food with meat meals. What’s it like? High in butterfat, sour cream is rich. It’s quite possible that the manna the Israelites gathered in the desert tasted like bananas and sour cream; I can’t say for sure. What’s that mean? A sponge cake is a cake leavened with beaten egg whites. It’s called that because of its texture. What’s in it? Most sponge cakes are flour, eggs and sugar, with vanilla or lemon rind added for flavoring. Observant Jews make kosher-for-Passover sponge cake by substituting finely ground matzah, called matzah meal, for the flour. Passover sponge cakes are sometimes made with chocolate flavoring or with sliced apples. When do you eat it? Jews in North America mainly eat sponge cake for Passover, but Jews in Britain eat a Sephardic sponge cake called playa and other variations, year round. Thanks to Claudia Roden’s Book of Jewish Food, so do I.
What’s it like? A well-made Passover sponge cake is a miracle, because they are so hard to make. Ideally they are light, like angel food cake, and the egg whites don’t separate. What’s that mean? It really does mean a tongue! Pickled cow’s tongue is a popular deli food. What’s in it? A cow’s tongue–and a lot of cholesterol. When do you eat it? Pickled tongue is eaten sliced as a sandwich meat on rye bread with mustard. What’s it like? My aunt is a big afficionada of tongue, though she doesn’t indulge much anymore, and she says, “Good pickled tongue is similar to corned beef in that the secret is in the pickling recipe, but tongue has a mellower flavor.” She says most major kosher deli brands do a great job, and that it’s best to ask for the meat to be sliced from the tip to avoid gristle. What’s that mean? It either means simmered or eaten together. To make a big tzimmes means to make a fuss. What’s in it? Carrots and/or sweet potatoes with dried or fresh fruit, sugar and sometimes meat, simmered for a long time. Some recipes also have orange peel and marmalade or apricot jam. When do you eat it? On Rosh Hashanah, when sweet, orange or gold colored food and carrots are all considered lucky foods to eat, tzimmes is traditional. What’s it like? It’s usually very sweet. It should appeal to people who enjoy candied yams or glazed carrots.